For the next few weeks I’m working my way through a massive bulk lot, filled with bulk LEGO and around 80 sets. I’m planning on building them all, giving them a quick review, and telling you all about the interesting parts I find. You can readPart 3 here. It’s been a pretty busy week, with a number of sets being built. There are still a fair few to go, so the pressure’s on! This week we had Mixels galore, and my first foray into the Aqua Raiders theme, but we’ll get to that soon. For now, let’s take a look at those Mixels! Volectro is another Series 1 Mixel, this time coming from the Electroids. I think there’s only him in the bulk lot, we’re missing the other two. It’s a shame, but he’s still my favourite one of the three. There’s one element in particular that leaves this Mixel in a league of it’s own – the yellow hair, which is actually a recoloured plant. This set is still the only set you can get the element in, so it’s a special one, but that’s it. The rest of the parts are pretty standard, although when the theme was released, the hinge ball joints were new. 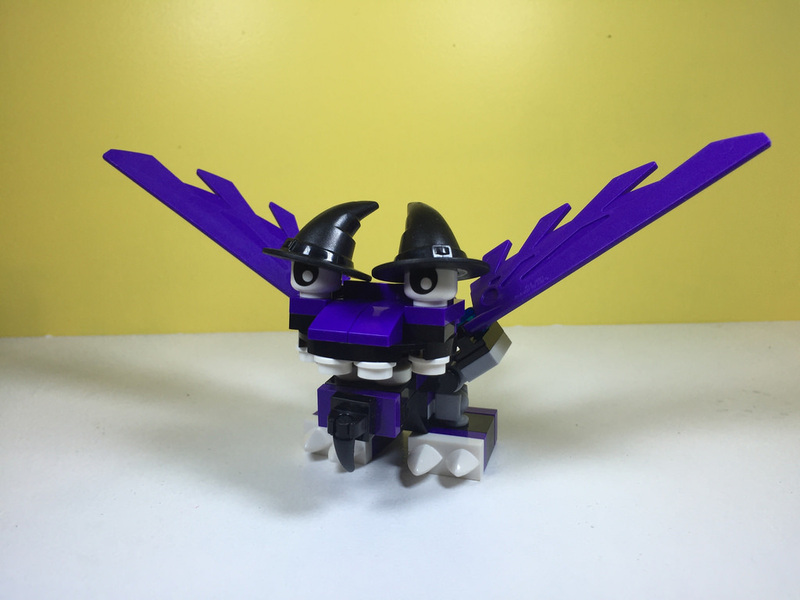 Nowadays they’re pretty common, seen in all the Mixels to date. The set has a bit of moveability, but not much. 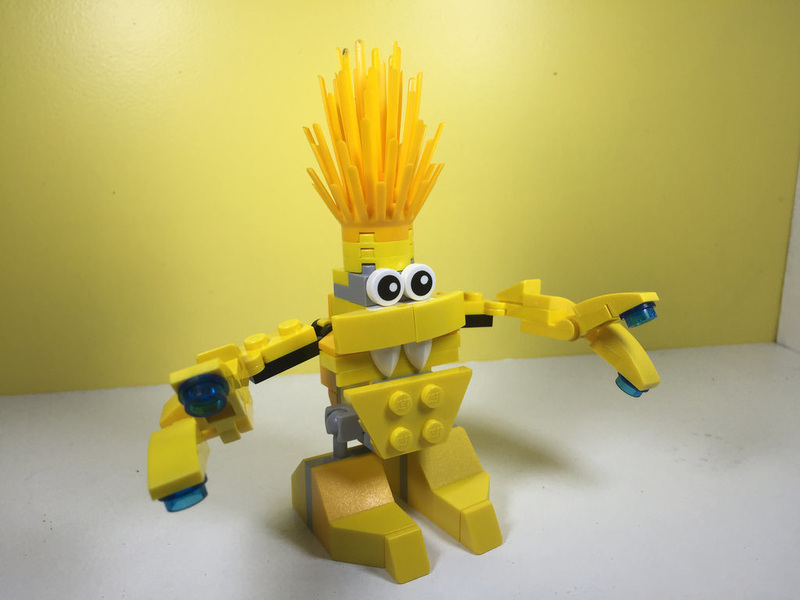 The legs are a little short, and the arms only move up and down from the shoulders, with the elbows bending and the fingers moving up and down. I’d like to see a bit more mobility in him. It can easily be changed after the fact. The build was pretty standard for a Mixel. It took me a bit of time to find the parts I needed – luckily there aren’t too many yellow parts in the pile! I’m not sure why, but Volectro’s bum keeps falling off! He’s got a SNOT 1×2 plate with 2×2 vertical studs, and it’s very loose. It’s a shame as the rest of the build is pretty strong. It’s got some basic SNOT, as most Mixels will. For all his shortcomings, he looks pretty great! The use of the bush for hair is very clever. There’s a pretty big difference in current sale prices – around $35 for new, and $15 for old. I think it might be the hair. This set is increasing in value, so if you’re able to get one or two, do so. It’s special getting a Series 1 Mixel – it’s a good theme to collect. It’s still a pretty run of the mill Mixel, but good to have in the collection. 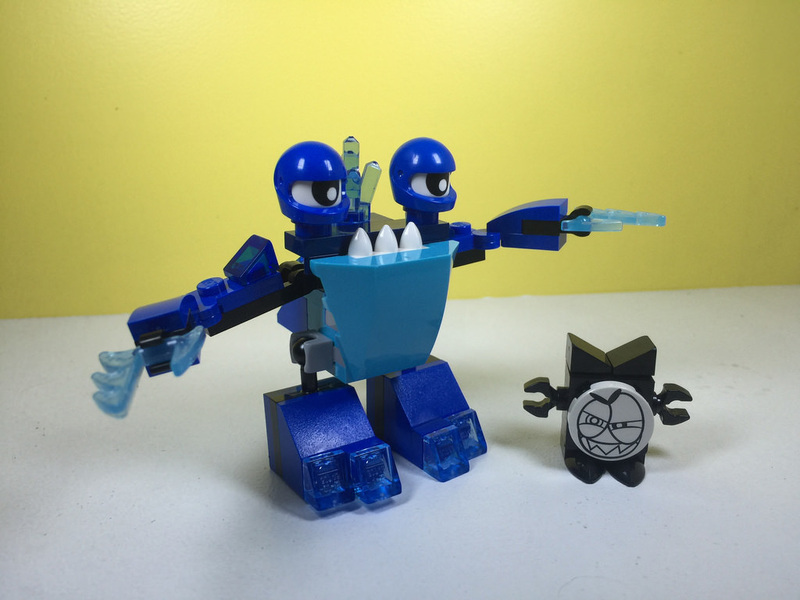 Slumbo comes from the Series 2 Frosticons. He looks pretty interesting! There are some very interesting parts in this one, as well as a lot of normal stuff. Firstly, I love the colours. These blues just look so vibrant! The big ticket items for me are the 4×3 brick with bow and angle, the cyclops heads, the blue transparent crystal, and those frost blades on his hands. They are a great addition to have, and can be used for lots of other things. You also get two blue helmets – they’re pretty common, but still good to have! Again, this one isn’t all that moveable. His shoulders move up and down, and his elbows in and out. He’s got the same amount of movement in his feet as Volectro. Nice to have some ability to position him, but there’s not that much. The build comes along pretty quickly – there’s not that much to him! He’s pretty strong though, so that’s good. I really like the use of helmets to give him that sleepy look, but the hands are just a little weird for me. I don’t know if he’s holding the frost blades, or if they are his hands! By the looks of the cartoon version, they are his fingers, but they just don’t look right on the build. The rest of him is pretty good. As with many of the Mixels, collectibility is high because they’re easy and well suited to collect. Value for money is a bit lower with this one. There’s not a whole lot of value to the individual elements here, he’s pretty mid-range compared to the other Mixels. The parts in this set are pretty good. The wings in particular are a nice addition, being seen in Chima and Elves sets already. We get two more cyclops heads, and two witches hats! These are brilliant – not hard to get, but a very fitting addition. Seeing as Mesmo has wings, he’s got much more swooshability. His legs are very limited in positioning, so that lets him down. Due to his short stature, the build comes along pretty quickly. He’s pretty strong too. His wings and those hats are a great couple of features. I like his little goatee on his chin, but his teeth don’t look that great. Many of the Mixels have spiky teeth, but the use of 1×1 plates and tiles just don’t do him justice. Some fangs would have gone really well with the build. This little guy isn’t doing so great in the resale value area. Over the last few months on Bricklink, he’s not yet broken $10. There might be a change in the air with the prices available now, but I can’t see it happening. For some pretty nice parts, the collectibility and is pretty low with this one. On the other hand, value for money is pretty nice, with these low prices. Lunk comes from the Series 2 Frosticons, just like Slumbo. He’s a bit of a goofy looking character, with a long neck. The elements in this set are pretty mediocre. There’s only two elements of note – the ice swords used as snot (actual snot, not SNOT like we know it! ), and the transparent 2×2 pieces on his head and belly. Lunk has not very much mobility in his arms, as they’re only pivotable in one direction, but his neck has a variety of movement, as do his very short feet. They’re a little small, so not much, but there’s some there. He’s also able to balance on one foot due to his low centre of gravity. The build with this little guy is pretty good. He’s pretty durable, and comes together pretty quickly. 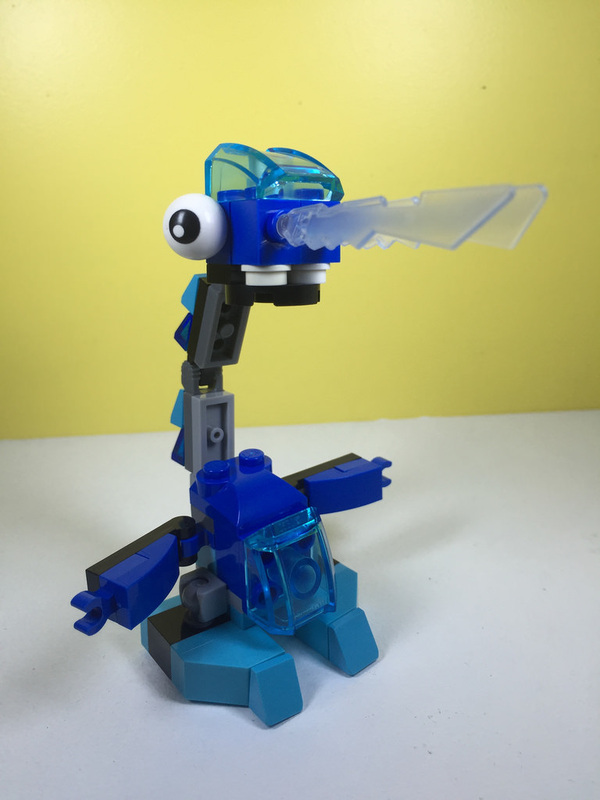 He’s just a touch different to the other Mixels I’ve seen. I really like the look of Lunk. He’s very different, with the elongated neck. His hands are once again very small but I think it’s ok – it suits him. Once again, Lunk is a Mixel, so they’re very collectible. The going rate on this set is pretty steady, sitting at around $12. 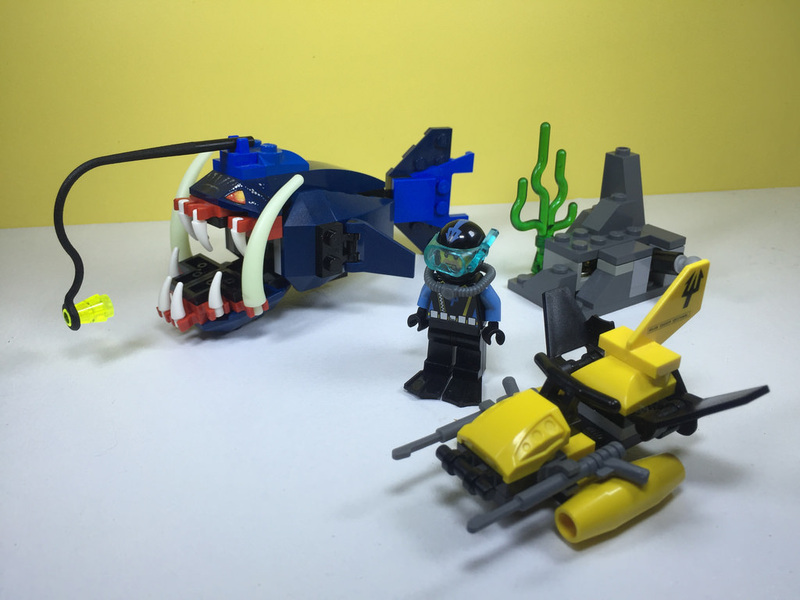 The Aqua Raiders is a theme of seven sets (I’m going to be building them all) that focus on a bunch of under-water deep sea divers and their exploits in the Bermuda Triangle. There are some great sets here, with some beautifully crafted sea creatures. The submarines and high tech equipment is pretty good too! 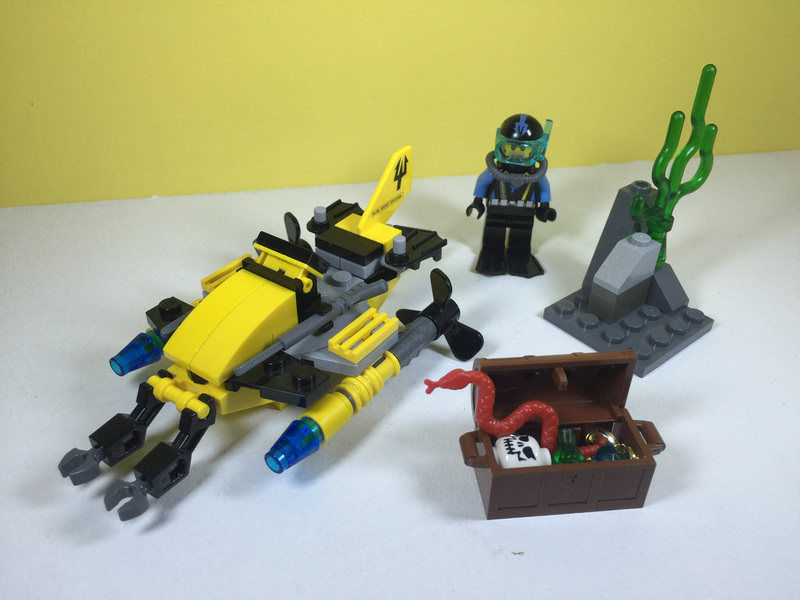 This one is the smallest of the theme, with a small one man submarine, and a treasure chest with goodies, and a couple of snakes. When this set was released in ’07, the rear stabiliser in yellow was a new release element. The minifigure was also a new design, with the printed trident helmet and diving mask. This element has been seen in many underwater sets since, and also in this year’s Deep Sea Explorers sets in the City theme. The seaweed and spearguns are also good additions, and many more will be seen in the Aqua Raiders theme. Aside from that though, the elements are pretty standard. When I was putting this together, the minfigure was missing (he’ll turn up somewhere), and a snake was missing, but everything else was found. A pretty great result! While the set is great, and the submarine allows for some really good play, with the possible swooshing around of the submarine thing, there’s only a couple of other things you can do with the vehicle, if this is the only set you have. The grabbing claws at the front of the vehicle are able to grab a hold of the treasure chest, and even the seaweed or a snake, but that’s it. The diver is able to get one of the spearguns and swim off by himself as well. It does have some good playability, but this is really enhanced with the other sets. The build comes together pretty quickly (if you have the parts readily available). The rocks come first, followed by the filling of the treasure chest, and the vehicle being built last. It’s a pretty simple build, with one on top of another – nothing overly special. I like the look of the submarine, but there’s nothing for the minifigure to grab on too for steering! I thought this was a little strange. The rocks and seaweed to me seemed like a bit of an afterthought, but it does go well with the set, and if you only have this set, it makes it clear that the setting is underwater. For an relatively old set, the value for money is pretty good. It’s still pretty cheap to get online, especially if you’re looking at a used copy, with it setting you back less than $10. For a new copy, you’ll most likely pay double. The value is pretty steady, and I don’t imagine it getting any better, seeing as it’s an old set that won’t likely get a reboot, and being the smallest set of the theme. Collectibility-wise, it’s good to get, especially if you’re interested in getting the other Aqua Raiders sets. It’s the simplest one, but the value for money is good, so it’s worth it. It’s a cheap set, with some good parts included, it would have been a stellar option to purchase as new. Even now, it’s worth picking up. The build is simple, so great for kids, but doesn’t challenge the builder. The main thing is it looks interesting. This was the first Aqua Raiders set with a deep sea monster, the Angler Fish. It’s a small set, but a brilliant one. The year this came out, the newest elements were once again, the minifigure, the fins and jets on the underwater jet thing, and on the fish itself. On the fish in particular, the elements weren’t new, but the colours were. The earth blue elements are a beautiful colour, and there’s also no stickers on this – the face of the fish is printed on, which is a bonus. The other elements of note are the large teeth of the fish, that glow in the dark – what an inclusion! Some brilliant parts in this set. The minifigures in these sets are all very nicely printed, with some good accessories. I’m not sure if the jackhammer really fits underwater, but it’s good enough to pass! This set has a lot of swoosh to it! The fish’s fins are all moveable, and the big, imposing jaw moves up and down too, with the little underwater jet great fun to swoosh around. I don’t know how it’ll go matched up to that monster fish – maybe it’s really fast? There’s also an added bonus play element in the set. If you push down on the lever in the rock, the top pops off to reveal some treasure underneath. It’s a great addition. The build starts with the rock part. It’s pretty simple, so comes together quickly. The underwater jet comes next, again, being pretty quick to put together. The best part of the build is obviously the fish. You start with the top jaw and body, followed by the bottom jaw and monster teeth. The sides of the fish come next, with some simple SNOT techniques, finished off with the tail. It’s a great build experience. Simple enough for younger kids to try, and good enough for adults to get a kick out of too. This set, and the fish in particular, look fantastic. It’s easily recognisable as an Angler Fish, and is scary looking too! A great design that LEGO should definitely be proud of. I also like the fact that the jet is stand-up driven. The missing point here goes to where the second diver goes. Does he hold on to the wing, or just swim himself, hoping to outrun the fish? It’s a very small gripe, but I felt had to be mentioned. Aside from that, it’s a brilliant set. 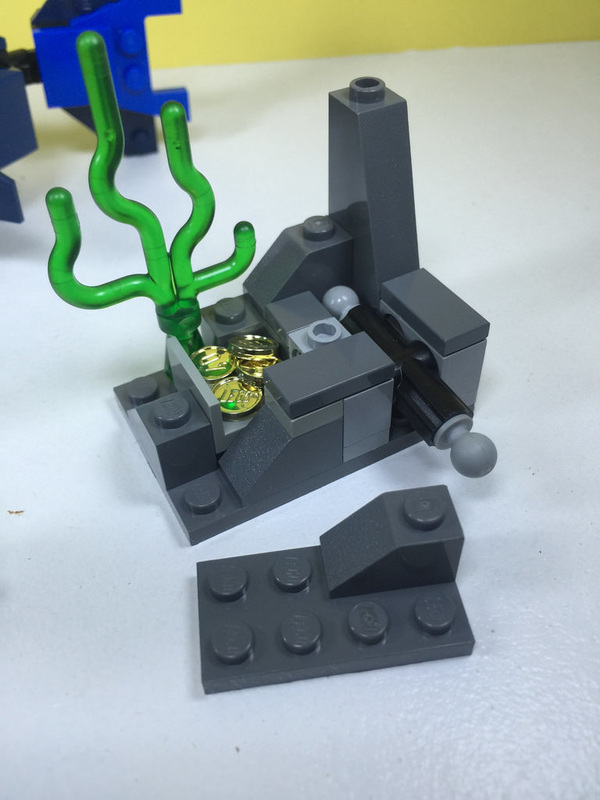 Being the only Angler Fish in the LEGO range, this set is a must for underwater fans. It’s a great addition to an underwater theme. The collectibility, especially if you’re getting the rest of the Aqua Raiders theme is pretty high. Value for money is seeing a bit of a steady increase, but the used sets are pretty stable at around $10. If you’re looking at a new set, you’ll need to triple that. It’s still worth it though. A great set to get, that will get people marvelling at LEGO once again! That’s it for this week – I’ve built a few more sets, but they’ll get reviewed next week. There’s still plenty more to come. Stay tuned!